Marlin Roush (RIO R&D/OEM development) rightly states that “line stretch equals missed fish.” This is entirely due to a line’s energy absorption, which reduces sensitivity and, unfortunately, increases reaction time. A line with average stretch is more forgiving when it comes to cast timing, so it takes a few initial casts to readjust your (casting) bearings when first using RIO’s new Perception fly line. You note immediately that the line “asks” for more precisely timed casts. The best advice I can offer when fishing the Perception for the first time is to pay close attention to your drift: the third and last component of a cast. Be sure that your drift it is carried out in full, doing so will allow you to appreciate one of the line’s major benefits: since the Perception produces near zero “bounce back,” you can expect your fly to land with truly pinpoint precision. Finally, the no-brainer that everyone saw coming: hook sets. Less stretch does indeed equal higher sensitivity and fewer dropped fish. I noted that takes on the Perception felt far more electric (for lack of a better term) than with other lines, thereby cutting reaction time by a few but very precious fractions of a second. 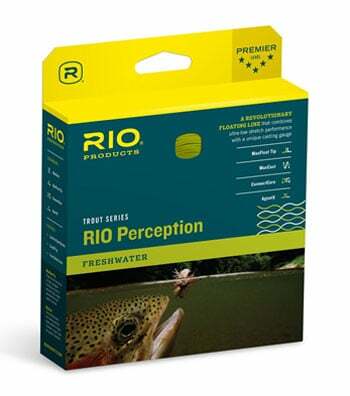 The Perception is one of RIO’s top-tier products, so expect all the bells and whistles: a semi-aggressive, balanced casting taper, MaxCast hydrophobic coating, an 18” MaxFloat tip. The line is also tri-colored to provide a quick visual reference for pinpoint accuracy. The line was tested with a Sage Circa as well as a St. Croix Legend Elite, finished with 9 to 12-foot nylon mono. 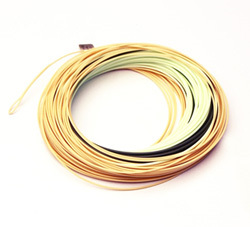 It easily allowed for ultra-precise presentations (with both rods) of tiny dries to small streamers at distances of 15 to 50 feet. One other thing that crossed my mind while I was putting the Perception through the paces: this line is all about sensitivity and accuracy, so it has ‘permit’ and ‘bonefish’ written all over it. Not reconfiguring it for saltwater would be an absolute shame.